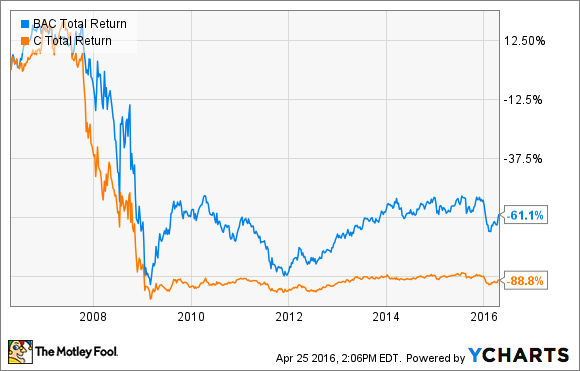 What does Bank of America's past say about its future? If you want to understand Bank of America (NYSE:BAC), or any bank stock for that matter, then you must have a grasp of its historical performance. The consistency of a bank's earnings over a long stretch of time, more than anything else, speaks to the rate at which it could compound shareholder value in the future. Data source: Bank of America, Wells Fargo, New York Times. Bank stocks aren't short-term investments. Because of the amount of competition in the industry coupled with the strict regulatory environment in which they operate, a bank like Bank of America won't grow its revenue or earnings at the rate of, say, a Netflix or Amazon.com. As a result, the only way to come out ahead with bank stocks is to pick ones that consistently compound value at a respectable rate over many years. Losses are particularly problematic for banks because they throttle the rate at which a bank is able to compound shareholder value. Furthermore, because the typical bank holds $10 in assets for every $1 in capital, even a temporary 10% decline in the value of a bank's assets confronts it with two bad choices: dilute existing shareholders by raising new capital (generally at a very low valuation) or accept insolvency. We saw this during the financial crisis in the case of both Bank of America and Citigroup (NYSE:C). Bank of America's losses led it to more than double its outstanding share count. Citigroup more than quadrupled its. The net result is that their stocks are still down approximately 60% and 90%, respectively, over the past decade. Bank losses almost always stem for poor risk management, which in turn derives from a bank's willingness to subordinate risk managers to revenue generators in the decision-making hierarchy. This willingness is embedded in a bank's culture. Consequently, if you come across a bank that has lost money in past credit cycles, as Bank of America has, you should take that as compelling evidence that it doesn't have the culture of prudence that's necessary to avoid losses (and shareholder dilution) in future credit cycles. Wells Fargo offers a good counterpoint. It hasn't recorded an annual loss since at least 1966, which is as far back as I could get data. Over this same stretch, it's been one of the best performing stocks in the United States. A quarter century ago, Warren Buffet's Berkshire Hathaway paid $290 million to buy 10% of Wells Fargo. The position is currently worth $23 billion and generates more than $700 million in dividends annually. It isn't a coincidence that Wells Fargo has avoided losses and generated industry leading returns over the last few decades, while Bank of America has had the opposite experience on both fronts. As you can see in the chart at the top of this article, Bank of America has reported losses in two of the last major cycles while Wells Fargo's earnings have never dipped into the red. This doesn't mean that Bank of America's stock isn't a buy right now -- as I tend to believe that it is. However, the rationale for buying its stock is tied to the fact that its shares are trading for a 40% discount to book value and not to the likelihood that it will someday compete on a level playing field against the likes of Wells Fargo.